Wash & dry apples, remove stems, and insert a stick into the center. In a pot over medium heat, heat sugar, water and corn syrup until boiling. Continue to boil for 10-15 minutes until the sugar mixture reaches 300 degrees. Remove from heat, and stir in the food coloring and flavor oil. Carefully (but quickly!) dip each apple, and place on a sheet of parchment paper to cool/set. 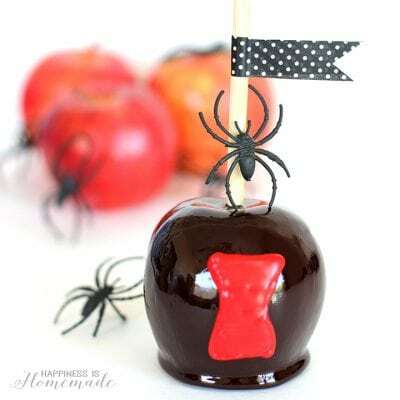 When the black candy is hardened, use red icing to pipe an hourglass shape on to the center of each apple.